Did you achieve your income goals? Did you hit your recruitment targets? Did you grow your business and Authority? Did you position yourself to become irresistible to your clients? From January 9th to 10th I will be teaching a select group of people how to build a marketing machine that will yield monster-size gains in their businesses this year...using my “Invest, Learn, Teach” method. This once in a lifetime event will take place in Hyatt Place, Coconut Point, Estero Florida. I will provide you with a recording of this event. 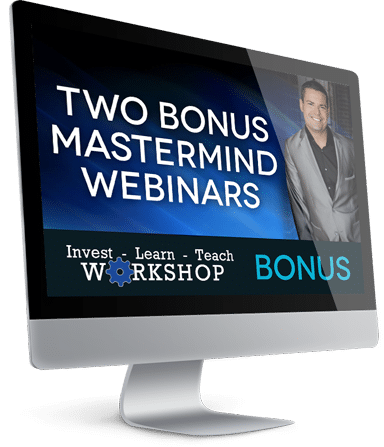 Order today and after January 12th you will receive an instantly downloadable mp3 where you can listen in on everything I taught on the “Invest, Learn, Teach” method to a select group of people. Yes that’s right... you get to listen in on my elite strategies for making 2015 the best year of your life with my special recording of everything that goes on inside this closed door exclusive event!! With ANY target market you might be trying to reach in your business, there is training that is always desired and you DON'T have to be an expert to help them. Think right now about the type of information & training your target market might be looking for & then invest in yourself to learn it, and then teach it to them. Training does NOT cost an arm and a leg to create AND it actually makes you better while you learn it. Soon, as you master this idea, you create an awesomely profitable circle that as you learn, you teach and as you learn, you earn. On January 9th – 10th, I'm going to teach a live audience my personal system for doing this. 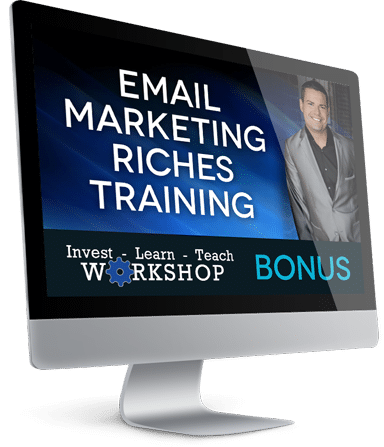 This system is what has helped me become an authority in my niche, a two time best selling author and earning millions in just the last few years. You'll discover everything from how to learn...what sources to go to in order to find the right type of training, how to learn and apply it to your business with SPEED (even if you currently have a full-time work schedule)…and exactly how to leverage it to generate a bigger following, more leads & more sales in your business. But Wait! Limited Time Offer: Get It Now For $497! Fast Action Bonuses For FREE!! to ensure you are implementing. Don’t Miss This Incredible Opportunity!! The bottom line is this...one ticket for this event is $497 to attend in person. Plus with the added cost of flights, accommodation etc. you can add on another $1500 minimum to the ticket price if you were to come in person. And that’s a tiny drop in the ocean compared to the return on investment you get when you apply the principles of “Invest, Learn, Teach”. You don’t have to invest $2000 today though. 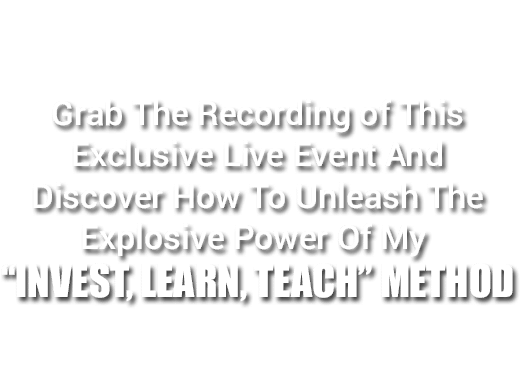 You can get your hands on the recording of the “Invest, Learn, Teach” method today for just $497. Don’t Delay-You Need To Act Right Now!! This powerful life changing recording is only available at $97 for a limited time only. The price will then rise to $197 before it’s withdrawn altogether. I’m Not Satisfied Till You Are!! You risk nothing here. If you’re unhappy for any reason what so ever...If you are not absolutely thrilled when you access this recording...simply contact me within 30 Days for a full no hassle refund. You’ve got An Important Decision To Make Here! You’ve a simple choice to make here. You can let 2015 be the same as 2014. You can see the same results and keep struggling if that’s what you’re doing right now. Or you can make a real difference in your life for a risk free $497 investment. It’s a complete no-brainer. Get the inside track today on what creates massive success for myself and countless other network marketers today. This offer will be withdrawn soon. Act now. Hit the Buy Now button and avoid disappointment. ILT has been a game changer for me. Before learning that method I was always stuck on thinking I had to create new and innovative content or just do nothing. But, ILT taught me to take what we learn from other experts, then dispense that to others who need it I n our voice, much like a college professor would. That helped in more ways than I can explain. The mastermind setup you guys run is awesome in the fact that you do your teaching, but then bring other group members in to teach things they are masters at...that is the true definition of a mastermind! It's not only enlightening to learn, but empowering to see many others teaching the group and picturing yourself being that person and knowing it is doable with focused effort. This is all on top of the incredible camaraderie and friendships that result from getting such a group together. The thing about Invest, Learn, Teach is anybody... even a small town country boy out of Montana can use this method. I am telling you, if you stick to your guns with ILT, you WILL create a dynasty. I promise you that. By employing the teaching Ray taught me, I went from 5 to 30 leads a day. Trust me... It's a game changer! The value that has been brought into the Higdon Mastermind is tremendous. They have implemented a method known as ILT or Invest Learn Teach. Ray and Jessica have been on a Mission to bring Value to our Mastermind by continually investing in the most cutting edge marketing strategies, learning it and teaching it to their students. It's such and simple concept to follow. You only have one way to go with it and that's UP! I have implemented this strategy in my personal marketing campaign and have seen tremendous growth in all areas. Success Leave Clues. Follow what the successful do. Over the last few years as I have been learning about attraction marketing, I had heard other trainers talk "around" this concept, but no one really pulled it altogether until Ray Higdon's ILT method. This method has taught me that I have a treasure trove of knowledge that someone out there is craving and now, I can't produce content fast enough! The ILT method has not only totally transformed my business, but me in the process. You can't implement this method without growing yourself, increasing your value to the marketplace and consequently growing your income! Thanks Ray! I'm grateful for the Higdon's everyday because, as a new marketer, the masterminds they provide has accelerated my learning by at least 10X. They work together as a team to provide an atmosphere conducive for rapid growth. One of the most valuable things both Ray and Jessica consistently teach is their Invest...Learn...Teach method. This simple concept has been a game changer in the value I bring to the world. ILT- Invest, Learn, Teach is the most important concept to success and duplication and one that is missing from every other training I've 'invested' in. Being taught in a way that can immediately be implemented AND taught is how we TRULY help others to help themselves and others. It is the difference between creating dependency vs creating independence and freedom. This changes everything. It's the ultimate 'ripple effect' backed with intention of a heart to empower and lift by example rather than manage by 'direction' and steps. Could it get easier than this? What a weight lifted. Thank you. Now more than ever, it becomes so important that we aren't selfishly keeping what we learn to ourselves! 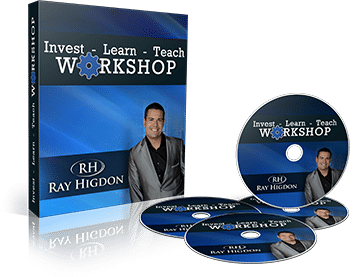 Absolutely love Ray Higdon's Invest Learn Teach Method. I was inspired to share more of what I've been learning through the coaching program. I've incorporated this strategy into my practice and it has totally paid for itself many times over. This mastermind is THE BEST investment I have made for my business and myself!! Getting access to Ray and Jessica Higdon on a daily basis is amazing plus we also get to learn from the other masterminders and let me tell you, it is incredible what you get to learn by being around such BIG thinkers!! From applying what I learned in this group and the Invest-Learn-Teach method, I was able to sponsor more people in 2 months than I did in one year before!!! The ILTmethod is the way to go! Value equals money. Provide value with this method and you WILL absolutely make money and make your dreams come true!! I love ILT! Ray Higdon's style of teaching makes it easy to learn 4 the material and then teach it to someone else. You just have to invest some time in your own personal development and then share it with others. You get what you want when you help others get what they want. Thank you Ray for giving me the tools I need to go out and make a difference not only for myself but for my teammates and other's. If you are currently doing training or stuck and need a push to move forward in your business then this training is a must! I love ILT! Ray makes it SO simple. If you want to really and truly learn something, you must teach it! Ray teaches you to pay it forward! If you're already investing in yourself, learning from courses, seminars, books and more - TEACH it and bring it all full circle! Thank you Ray! So grateful for giving me the clarity to make a difference! Even though I am a grandmother, I am new to this profession of Network marketing. In my quest for knowledge I came across Ray and Jessica Higdon and knew immediately that I could learn from them. I attended the first live event just 8 months ago and that was when my direction in my business took a huge turn. By implementing the Invest, Learn, Teach (ILT) method for my marketing, I am now seen as someone whom others want to follow. Do you know how HUGE that is? For my business? HUGE! However, I must say that when I attended the Mastermind Event, I was blown away with the information shared and absolutely loved hanging out with such amazing wonderful people who I know will be my life long friends-and whom, by this connection, can be relied upon. Thank you so much Ray! 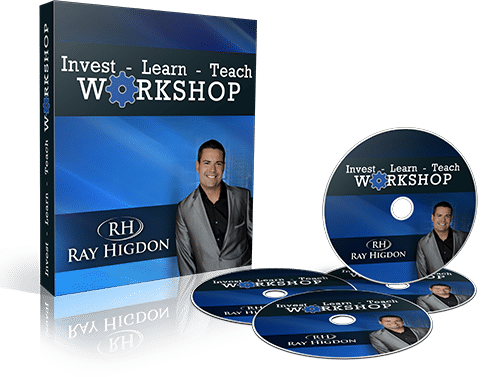 Using Ray Higdon's ILT Method - Invest, Learn, Teach has become the core growth strategy I use for my business. This method generates credibility, helps me build trust and rapport and allows me to better serve my prospects, deepening relationships with them. Specifically, I now generate over 50 leads per day through consistently using this method. The first time I heard you teach it, it blew me away! How many books have I purchased as well as training courses and just put them back on the shelf when I finished- now I can use all of them to create content- it is such a relief and gives me confidence knowing I will never run out of content to write about! You don't even realize when you are starting out either how people would actually find value in learning the information- not every one wants to read the book or do the full training themselves. This was actually one of the most valuable things I have learned from you! Thank you for teaching it! Ray Higdon's ILT Method is by far the most useful piece of information I've received so far as a network marketer...It has opened up a new perception on life and how I operate my business! This strategy has transformed my life & I highly recommend using it if you want a Successful home business! It's the foundation for Success...Thanks for bringing this to your community and the world! attendees share their biggest takeaway with you! Can't wait for you to experience this transformational seminar recording! P.S. Remember, this recording is available for a limited time only. Then it will be gone for good. Don’t miss this opportunity to make 2015 a life changing year when you look back on it. If you'd like to make a powerful marketing machine just like my wife & I have, make sure you grab your recording now.